The taxi rank is located at the exit of the airport. The distance is 38 km and the cost is 51 euros per journey (approx.). There may be a supplement for luggage, holidays or night services. The bus stop is located next to the arrivals terminal. The company that offers the service is Sagalés / Barcelona Bus. This service is only operational from April to October. From the bus station to the hotel there are 2.8 km approx. Go towards Aiguaviva through the GIV-5331. Take the C-25 until the A-2 or N-II indication. Merge onto the N-II towards Tordera-Barcelona until the fork direction Tossa de Mar / Lloret de Mar. Merge onto the C-35 and take exit nº 94 towards Tossa de Mar / Girona / Llagostera. Take the second exit towards Tossa de Mar onto GI-681. Continue approximately 13 km until you reach Tossa de Mar. Please view the map above for more details. The San Eloy Aparthotel has double rooms situated in 'La Masia'. Each room has air-conditioning, two individual beds, with the possibility of adding an extra bed for a child between 0 and 7 years old, a refrigerator, full bathroom, satellite television and optional safe. For Half Board & Full Board bookings: water, wine, beer and soft drinks ARE INCLUDED with your meals in the restaurant . The Aparthotel San Eloy has studios of 29 m² each with capacity for 2 or 3 people. Each unit has air-conditioning, two individual beds and a sofa bed and a bathroom. All studios are situated on the third floor and have balconies, telephone and satellite television. Half Board & Full Board bookings for Summer 2019 will have water, wine, beer, or soft drinks INCLUDED with your meals in the restaurant. The Aparthotel San Eloy has apartments of 35 m² each with capacity for 2 to 4 people. Each has a bedroom with two individual beds, a sofa bed in the lounge for 2 people and a bathroom. All of them have air-conditioning, satellite television, optional safe, balcony and they are situated on the third floor of the aparthotel. The Aparthotel San Eloy has apartments of 40 m² each with capacity for 4 to 6 people. Each consists of two bedrooms, one of which has a double bed while the other has two individual beds, a sofa bed in the dining room for one or two people and a bathroom. All units have air-conditioning, satellite television and an optional safe. The Aparthotel San Eloy has apartments of 40 m² each with capacity for 2 to 5 people. Each has a bedroom with two double beds, a sofa bed in the dining room and a bathroom. All of them have air-conditioning, satellite television, optional safe, balcony. They are situated on the ground and first floor of the aparthotel. Our newly refurbished Superior Family rooms provide a modern and contemporary decor for your comfort. Our Family Superior rooms are open plan with a small lounge area at the entrance to the room with a sofa bed, leading through to a spacious bedroom which has two single beds and two pull down beds. A sliding door separates the bedroom from the lounge area. The bathroom is a modern fully equipped bathroom with walk in shower. Air Conditioning is provided in each room with individual control. With flat screen TV’s, mini fridge, microwave and kettle and optional safe, our new Superior Family rooms provide an extra level of comfort. No kitchen available. 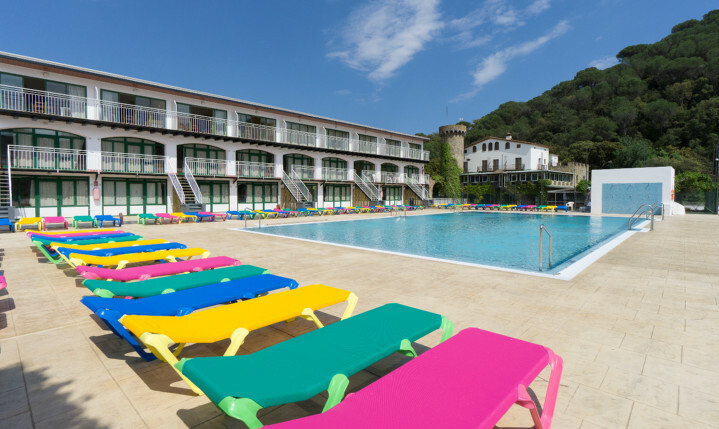 The Aparthotel San Eloy enjoys a fabulous location on the outskirts of the resort of Tossa de Mar, just 2.5kms from the main beach and resort centre and with easy access to Girona Airport. Set on the edge of a pine forest it is the perfect setting for those who want to enjoy the countryside, pools and the beach. There is never a dull moment at the San Eloy, with our in-house entertainments team organising activities and shows for all of the family by day and by night. Our buffet restaurant offers a selection of regional, national and international dishes, and theres a terrace where you can relax and enjoy a drink whilst watching the sunset, or the children playing. With three pools and a variety of accommodation options depending on your needs, the San Eloy is the ideal option for a family fun holiday. Interactive Splash Pools and bright, modern Family Superior Rooms are available! Half Board & Full Board bookings for Summer 19 will have wine, beer, or soft drinks INCLUDED with your meals in the restaurant. 9:00 a.m. to 9:00 p.m., except at 2:00 p.m.). This service is free for those who have booked the All-Inclusive package. • Large garden with lawn. • Wide selection of sports and leisure activities organized by the entertainment team. • Shows and evening entertainment programmes. • No pets allowed, except guide dogs. We have a buffet-style dining room service, in which you will find a wide variety of regional, national and international dishes to choose from. • Paid parking 5 €/ day (subject to availability on arrival). Parking outdoor and unsupervised. • Situated in a Mediterranean forest. • 2.5km from the beach. • Minibus from the hotel to Tossa de Mar.